​The NTA Board of Directors thanks all who attended our 23rd professional development conference, Tutors: Bridging the Distance. This was truly one of the best conferences thanks to you, our dedicated and hard-working tutors, the staff at Innisbrook, our speakers, and of course, Jose Feliciano. The NTA Board of Directors thanks you for a wonderful conference! It was a week of informative and fun sessions and keynotes, a lovely conference venue and setting, and amazing food. We hope you learned a lot, made lifelong friends, and had fun. Thank you to our vendors; we couldn't do this without your support. A survey will be sent to all registrants where you can share your thoughts and ideas on this conference, and future conferences. 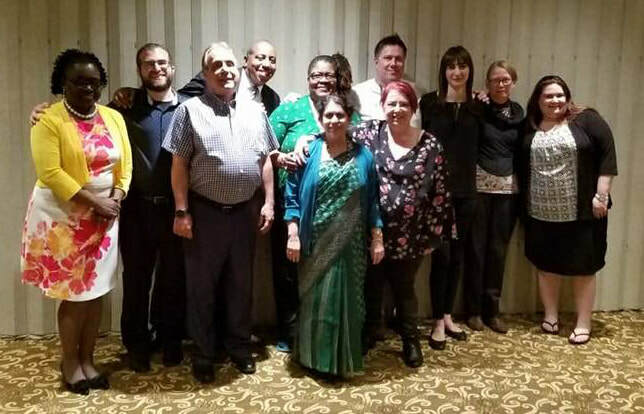 L-R: Karen Royster James, Joseph Pascale, Joe Caniglia, Ishmael Brown, Karen Stewart, Dr. Pamela Bandyopadhyay, Pete Conrad, Dr. Lucy Lapekas, Dr. Margaret Roidi, Carol Simpson-Warner, Stephanie Dunaieff. Not pictured: Brandy Daingerfield, Dr. Barbara Harris, Dr. Cheryle Snead-Greene, Miriam Osborne-Elliott, Carmen Wade, Melissa Cain, Trevor de Freitas, Kenny Fabara, Dr. Bill Miklosey. The 23rd Biennial NTA conference, Bridging the Distance, is in the can, as they say, and WOW what a conference it was! 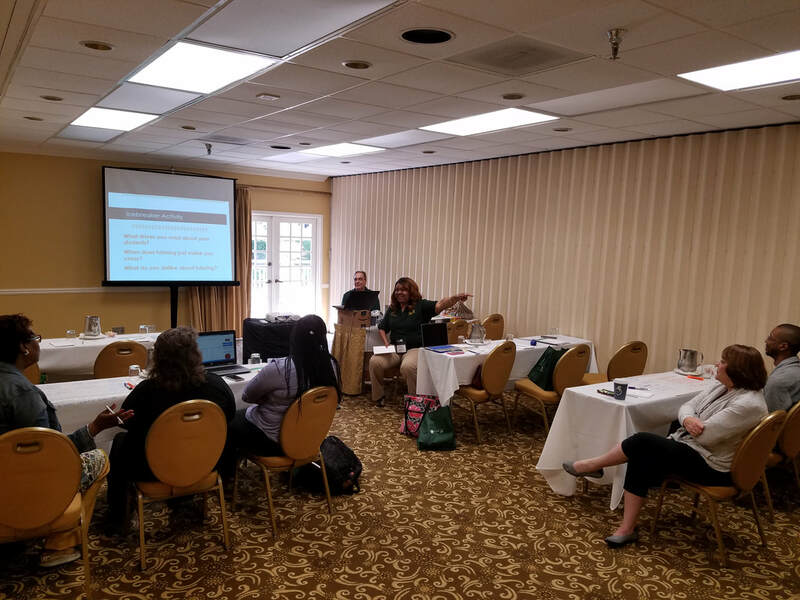 Dr. Carmen Wade and Joe Caniglia facilitating the Basic Tutoring Workshop. Ishmael Brown facilitating the Basic Academic Coaching Workshop. Bishop Dr. Broderick A. Huggins, Sr. Spoke at the NTA Conference! In 1995, Dr. Huggins founded a Seminary and Bible Institute, where many students from lay persons, ministry leaders, and pastors graduated from programs in California and Florida. Throughout his tenure as a noted “Evanedulist” Bishop Huggins has been a staunch advocate and supporter of higher education. For the past decade Bishop Huggins has been a community leader in the collaborative efforts of Super Sunday, an educational access program designed by the California State University (CSU) system and African American ministers. The program was created to increase access for African American students interested in attending the CSU. As a result of his enthusiastic leadership on this program, Bishop Huggins was not only asked to be the community representative on California State University Channel Islands’ (CI) Presidential search team but he was also asked to speak at CI’s 15th Annual Commencement Ceremony as well as one of the keynote speakers at the retirement celebration of CI’s Inaugural President, Dr. Richard R. Rush. Bishop Huggins tireless efforts to support education also showed in many ways in his congregation where he held commencement ceremonies for ALL graduates from pre-school to doctoral degrees. Each graduate was dressed in regalia along with the congregation’s 8-10 doctors who would greet and congratulate them individually. Pastor Huggins also had his annual Scholarship luncheon where he not only raised money for college bound students but he also announced what students were going where. Finally, Dr. Huggins welcomed honor students from Cal State Channel Islands to tutor local middle and high school students from the community at the St. Paul Annex. Also, under his guidance, St. Paul Baptist Church and the local university created a nursing outreach program at the annex along with a street clothing store for those individuals living with food and shelter insecurities. A devoted father and grandfather, Dr. Huggins enjoys spending time with family when he is not traveling for his ministerial work. Bishop Huggins earned a Bachelor of Arts in Religion from California Lutheran University, and in 2000, he earned a Ph.D. in Theology from Sacramento Theological Seminary. He and his wife, Toni, make their home in the city of Oxnard, California. The NTA will be collecting New and Like-New Books at the 2018 Conference. Bring two books (or more) and take one new title to read. Additional books may be purchased for $1.00. All unpurchased books will be sent to our airmen serving in the Middle East. All proceeds will be used to purchase personal care items to be sent to airmen serving in the Middle East. Starting immediately and continuing through the conference dates, the NTA will accept book donations through the mail, so even if you cannot attend the conference, please consider hosting a book drive at your tutoring center. The NTA will award the tutoring center that collects the most books. Please remember, all books must be in great condition, the material should be for adult readers (no children's books), and nothing x-rated. 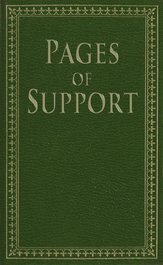 Each page of your donated books show support for our men and women and their families who so selflessly serve our country. Contact the NTA for additional information. The Inimitable José Feliciano Performed on Opening Night! The NTA's board of directors is proud to announce that the one and only José Feliciano will entertain NTA members on the opening night of the 23rd Semi-Annual Professional Development Conference! Mr. Feliciano will perform three sets (with a couple surprises). Between sets, Mr. Feliciano will speak about his life. After his performance, he will spend time signing autographs and taking photographs with members. Latin pop singer José Feliciano was born in September 1945 in Lares, Puerto Rico. Blind from birth, he and his family moved to New York in the early 1950s, where he began studying accordion, guitar, and voice. By the early 1960s, Mr. Feliciano was a popular Greenwich Village coffeehouse performer and soon landed a deal with RCA Records, issuing a string of popular Latin influenced folk pop albums sung in both English and Spanish. His best known, most popular singles include a 1968 cover of the Doors’ single Light My Fire, a version of Tommy Tucker’s Hi Heel Sneakers, the theme song to the ’70s TV show Chico and the Man, and the Spanish English Christmas tune Feliz Navidad. He released his most recent record, Senor Bolero II, in 2003. Constantly touring and recording since the 1960s, Mr. Feliciano remains popular worldwide and has received over 40 gold and platinum albums to date. Mr. Feliciano earned his sixth Grammy Award in 1991 and is the only performer who has won pop music awards in two language categories. Other honors include: The Alma Award for Lifetime Achievement in 2000, Artist of the Millennium Award presented by Premios Globos, and performing at the 75th Annual “Pageant of Peace” Christmas Tree Lighting Ceremony in Washington, D.C. with a reception at the White House afterwards. Mr. Feliciano and his wife, Susan, have been together since 1971 and live in a 270 year old colonial home in Connecticut. In 1988 they were blessed with a daughter, Melissa Anne, and in 1991 with their first son, Jonathan José. In 1995, José and Susan had their third child, Michael Julian. Mr. Feliciano‘s passions include writing and recording in his studio, baseball, and being a dad. Dr. Wm. 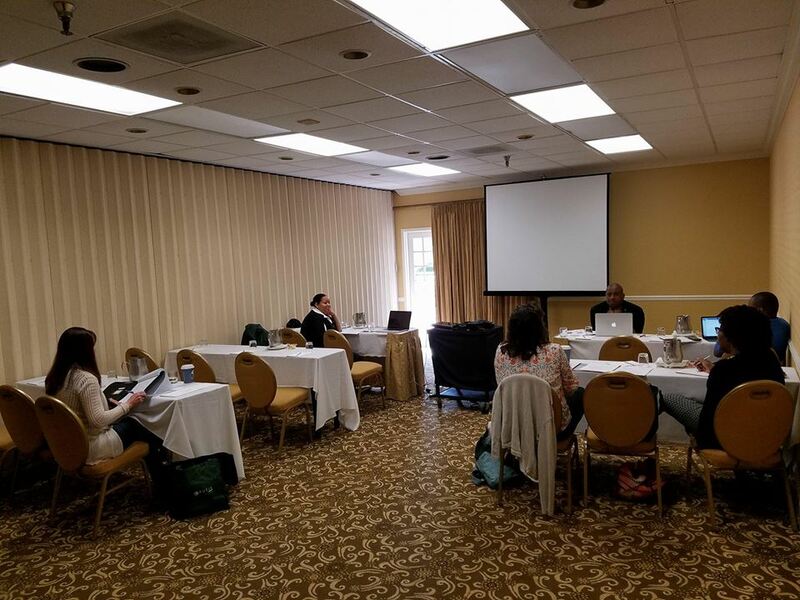 Gregory Sawyer Spoke at 2018 Conference! Dr. Wm. Gregory Sawyer, a native of Columbus, Ohio, is the founding Vice President for Student Affairs at California State University Channel Islands (CI). A popular and resonant keynote speaker at the 2016 NTA Professional Development Conference, we have asked him to join us again in 2018. Dr. Sawyer earned his Ph.D. in Higher Education Administration at the University of North Texas (UNT) in Denton, his Master’s degree in Organizational Communication from Eastern New Mexico University in Portales, and a Bachelor of Arts degree in Communication and English from the University of Mount Union in Alliance, Ohio. Sawyer was also the founding Dean of Students and Chief Student Affairs Officer at Florida Gulf Coast University and former Dean of Students at UNT. Sawyer has been recognized by the National Association of Student Personnel Administrators (NASPA) as a Pillar of the Profession (2016), the American College Personnel Association (ACPA) Excellence in Practice Award (2016), NASPA Region VI Scott Goodnight Award for outstanding performance as a Vice President for Student Affairs (2013); ACPA Diamond Awardee (2015); and ACPA Senior Practitioner of the Year (2007). Sawyer was also named the Most Distinguished Black Citizen by the Ventura County, NAACP and California State University Channel Islands Outstanding Administrator of the Year (Maximus-2005). In 2008 Sawyer was selected by the Trustees and Chancellor of the California State University (CSU) system, out of 46,000 faculty and staff, as the recipient of the Wang Family Award as the Outstanding Administrator of the Year. In 2013, California Governor Jerry Brown, appointed Sawyer to a three year term as a Commissioner on the California Student Aid Commission (CSAC).